David B. Adams, M.D. is Professor and Chief of Gastrointestinal and Laparoscopic Surgery and Co-Director of the Digestive Disease Center at the Medical University of South Carolina, Charleston, South Carolina. 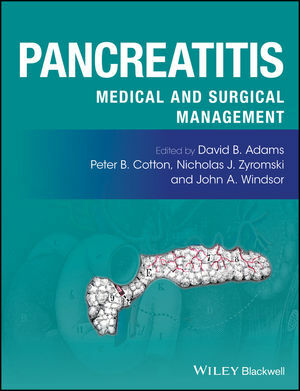 He is the author of over 100 manuscripts and book chapters which deal with his academic and clinical research interests in chronic pancreatitis. Peter B. Cotton, M.D. is a British Gastroenterologist best known for his advancement in digestive disease, pioneering and naming the ERCP procedure and creating the Digestive Disease Center at the Medical University of South Carolina where he is Professor of Medicine. He has been active in National and International organizations, and has given invited lectures and demonstrations in more than 50 countries His bibliography includes over 900 medical publications, including more than 300 original contributions in peer reviewed journals, and 10 books. Nicholas J. Zyromski, M.D. is Associate Professor of Surgery at Indiana University. He served as an NIH research fellow at the Mayo Clinic in Rochester, Minnesota, and is currently the Indiana University HPB Surgery Fellowship Program Director. Dr. Zyromski’s principal clinical interest is in pancreatic disease; his basic and translational research interest focuses on the inflammatory response of acute pancreatitis as well as the influence of obesity and adipose tissue on pancreatic diseases — pancreatic cancer and acute pancreatitis. John Windsor, M.D. holds a personal chair in surgery at the University of New Zealand, Auckland. He is Director of Surgical Research, Director of Surgical Research Network , Co-Director of Applied Surgery and Metabolism Laboratory and Surgical Centre for Outcomes Research and Evaluation, Principle Investigator Pancreas Research Group, and Associate Investigator Maurice Wilkins Centre of Biodiscovery. His primary research is in the pathophysiology and clinical management of acute and chronic pancreatitis. He is Associate Editor of the journal Pancreatology and the World Journal of Surgery. "This is a definitive and authoritative work that is quite manageable to read, understand and process.